Spoons are one of the most popular fishing lures on the market. They work to catch a wide variety of species in both salt and fresh water. Most spoons cost from $3-5, but watch the video below and see the guys at Real Outdoor Reviews explain how anyone can make one for less than a $1! Step 1: Clamp the spoon onto the scrap wood. Make sure the clamp is seated well on the spoon. Step 2: Using your metal drill bit, drill a hole in both ends of the round part of the spoon. The drill bit can wander on the rounded edge, so use a high speed and low pressure until the drill bit begins to bite. Step 3: Cut the handle off leaving space between the hole on the handle and the cut you are making. Once you are part way through you can bend the handle back and forth to break off the handle. Step 4: Thread the split ring onto the spoon, once the ring pokes through the hole, slide the hook onto the end and push all the rest of the ring through. Step 5: Done! Get out and go fish! 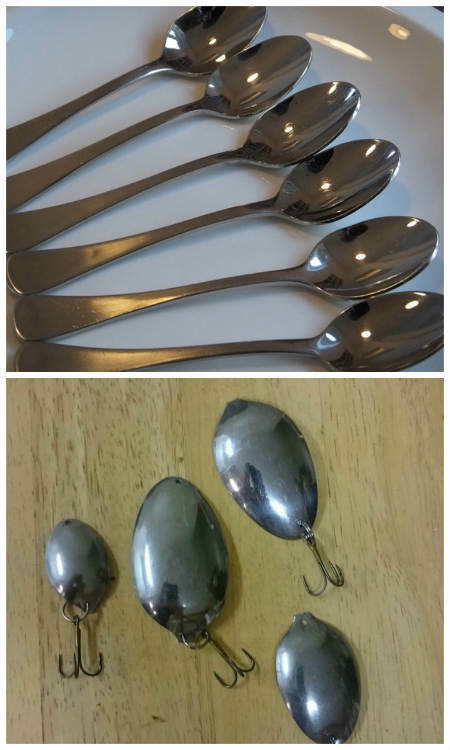 These spoons imitate a silver minnow swimming but can be painted to imitate almost anything! At less than a dollar they are a cheap way to restock your tackle box and make a great gift for any outdoorsmen you know!